ThereÃ¢â‚¬â„¢s another argument – or story – with respect to this. It is that the U.S. does see education as an investment and is simply asking what are we getting for that investment. Llarry52 is a master of the data, and with it, he makes a compelling case. I responded to his comment, but I had such a fun time (It’s the most fun you can have alone in a hotel room on Friday night, without getting in to trouble) writing this over-the-top piece, that I had to share it out here. Larry, and I hope I can call you Larry, you are obviously well read in the data on education expenditure and results collection, and the data does make a compelling case for an education system that is craving for money, yet willing to do no more than just site around and waste it. I suspect that I sound like the “Feeeeeed Me” monster in Little Shop of Horrors. I submit, however, that education, in its intent to take each child, each class, each school, and prepare a society of skilled, innovative, resorceful, and happily adaptive citizens is far more than the laboratory that your data makes it out to be. It is far more complex, rich, and exciting than simply counting out dollar bills, pumping in the teachers you’ve payed for, the curriculum you’ve paid for, the textbooks, art supplies, a compter here and there, and then watching shinning new adults marching enthusiastically into their futures. I maintain that investment must increase dramatically because we do not live in the 1950s, we’re not teaching Theodore Cleaver (Leave it to Beaver), and thirty-year careers are a relic of more secure and far less interesting times. Teachers are not technicians applying prescribed, laboratory-tested strategies. They are artisans who fill their classrooms and the lives of their children as human beings. I’m not just talking about money, though just about everything I am talking about will cost. We must invest in new definitions of what it means to be educated today, the roles of teachers, and what students do in their classrooms. We must restructure our schools of education, and invent a system of sustained, casual, professional development, where all teachers are, above all other things, life-long learners. We must invest time in our educators so that they can research, collaborate, assess, reflect, invent and reinvent, so that every class session is so exciting that children have no resistance to learning. I know I’m ranting pie in the sky. But shouldn’t the sky be what we aim for for our children, their future, and our future? Finally, I suspect that teaching a child in a small town in India, with scarce access to telephones, television, and the Internet, would probably be a little cheaper than successfully teaching a child with daily access in their bedrooms to the world wide web, gaming team members from around the world, a network of friends and collaborators, and the tools they need to invent to play and play to invent. When talking and writing about ethics and the new information environment, I frequently add a layer of responsibility to the producer of content, on top of consumer of content. We all talk about how important it is, and, in my opinion, ethically responsible it is to be able to prove the accuracy, reliability, and appropriateness of the content that we use in our arguments and our information products. I believe that it is equally important for producers of content to make it easier for consumers to use the information, and to validate the information that they use. This is why I try, when ever possible, to include citation in my posts, if only to model the proper use of intellectual property. With that in mind, and coming on the heals of Son of Citation Machine, I’ve just discovered this cool little plugin for WordPress, the blogging engine that I use. It’s called the Academic Citations plugin, and written by Julie Meloni. At the end of each of my posts, there is a link that says View Academic Citations. Click this, and a box appears with AMA, APA, chicago, Harvard, and MLA formated bibliographic citations. Very cool! Thinking Stick educator, Jeff Utecht, a teacher in Beijing, added to the New Story conversation early this morning (The Middle East — a new story), by passing along some facts that he received from a fellow international school educator in Dubai. 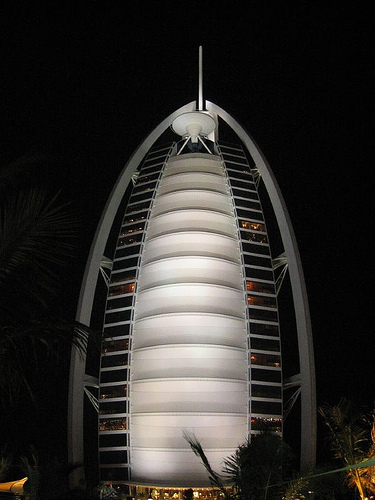 An extraordinary city, Dubai has often been an example, pointed to when looking for the future happening today. From 2002-2005 I spent my time teaching at Yanbu International School in Yanbu, Saudi rabia. An experience that I am forever greatful. During that time I traveled around the Middle East and saw some of the changes that were taking place there. 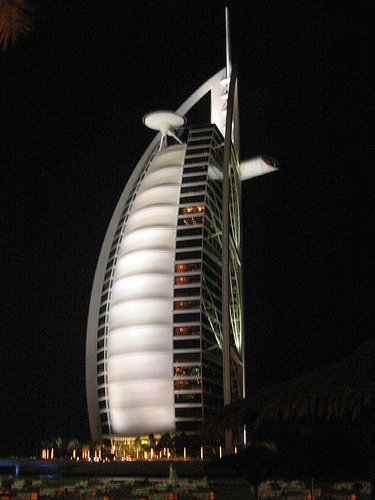 Although I never made it to Dubai the stories that were told about the city would have rivaled those during the days of the silk road to China. How the city was growing, expanding and much like China not an end in site. 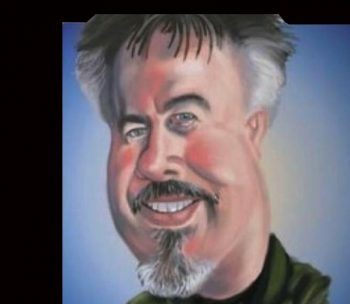 There are some pretty telling stories in Jeff’s blog that are well worth reading and retelling. I’ve already added a number of them to the “Hack the New Stories” wiki page, planting them under Community Stories and Reformer Stories. Off to the airport, and on to Lawrence, Kansas. bflickr, “Dubai Set.” flickr. 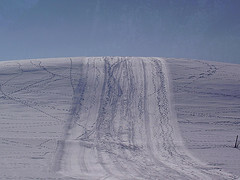 4 Feb 2006. 21 Apr 2006 <http://flickr.com/photos/bflickr/sets/ 72057594066507066/>. This is probably my last blog for the day. My writing happens in the mornings, and then I’m only good for manual labor. Plus, I hit the road again tomorrow morning to speak at a staff development symposium in Lawrence Kansas on Saturday, and then speaking nearly every day next week in four states from the Atlantic to the Pacific. (This is how you guru, Brian). Imagine that two-thirds of the packages FedEx absolutely positively promises to deliver by tomorrow morning never arrive. Imagine that on-quarter of all new iPods can’t play music recorded after 1999. Imagine that Gap advertises to the masses but sells its clothes only to rich customers. Now you have imagined the business equivalent of the U.S. system of public education (Daly 42-46). Despite being the wealthiest country on Earth, America maintains a public education system in which 30 percent of high school students don’t graduate, one out of eevery four reads below basic grade levels, and compared to students from more affluent backgrounds, few of their low income counterparts are adequately prepared for college. Other countries see education as an investment, but we see it as a cost. Most of the stories are from Friedman, Prensky, and Florida. We need some more diversity, so please add some. It would be great to have a collection of stories to suggest to teachers for open house in a few months. Daly, James. “Risky Business.” Edutopia Apr/May: 42-46. I sense a roll coming on! Please read Graham’s post for his comments, and if you like, carry on the thread. Author David WarlickPosted on April 20, 2006 April 20, 2006 Categories education2 Comments on I sense a roll coming on! I’m putting finishing touches on Son of Citation Machine (SOCM) today. I’ve enjoyed using an eight year old computer, running Linux, to finish up the coding over the past few days, and reloading the citations, adding a few additional ones that have been requested over the months. What’s new is the engine that drives SOCM. The citation descriptions are coming out of a database. This will make it much easier for me to make adjustments and to add additional sources that are consistently requested. There is a new suggestion link for this purpose. I have also included slightly more instructions for formatting than was in the original Citation Machine. This too, will likely require some tweaking. My business manager and I (that is, my wife and I) have been struggling with ways to start seeing some return on the time and server costs that we are investing in SOCM, and two ideas have surfaced (sorry, no open source, Tom). One is Google Ads. I’ve been surprised at the income that the Education Podcast Network has generated through Google Ads. It’s only one night out for Brenda and I, each month, but EPN isn’t getting hit that much. So we’re going to give the service a try on SOCM as well as some other advertising options, understanding that a lot users are professionals and college students. That said, the use of SOCM in K-12 schools is an entirely different matter. For this reason, there is a School Login link on the page. K-12 schools can click this link, register, and login. SOCM plants a cookie on the machine that immunes it to ads. I hope that this works out. Finally, and we are still thinking over the logistics, is a subscription version of SOCM that would give a local administrator the ability to edit their citations. A school could add source types that are regularly used by it’s students, but not included in the tool. They would also be able to add entire formatting schemes, such as Harvard, or another one that I just heard of today in an e-mail suggestion. This plan remains on the table for now. Commerce is a whole ‘nother bucket of worms. So that’s it, and expect Son of Citation Machine to appear by Saturday, perhaps as early as sometime today. I am sorry. I assumed that all of my readers (all 17 of them) already knew what Citation Machine is. Dumb of me. I built the first version of Citation Machine in 2000 as a way to help teachers generate valid citations for their teaching materials, modeling the proper use of intellectual property. 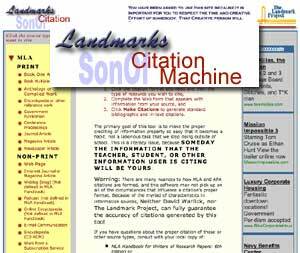 It has become quite popular among students and professionals as well, over the years, and Son of Citation Machine is the third major re-build. I’ve always strived to make it simple and quick, and not a tutorial. You go to the site (http://citationmachine.net/), and click the citation format you want (MLA or APA), and then the source type you wish to cite (22 in MLA and 19 in APA, Print & Non-print). CM presents a web form that asks for the information that will be needed for the citation: author, title, publishing date, city, and company, date accessed, etc. Click the submit button, and the tool generates the appropriate bibliographic and in-text citations, that can be copied and pasted into the user’s word processor (or whatever). 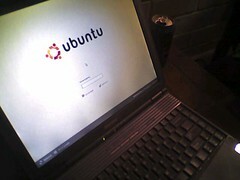 I considered using a different distribution, but decided on Ubuntu again. I continue to be intrigued with Open Source. In fact, for some reason (I’ve just blogged about it once), I’ve been asked to lead a round table discussion about OSS at the upcoming TechForum event in Chicago next week. I’m certainly going to have a lot of questions and plan to learn a lot. I guess that’s what a roundtable moderator is supposed to do. Yesterday, I bought a 40gb hard drive for an old Sony VAIO laptop I used for presentations many years ago (two G4 Powerbooks ago). The machine has been in mothballs since my daughter finally got tired Of my having to reinstall Windows on the machine every three weeks. She insisted on using KaZaa, which insisted on flooding the 6gb hard disk with muck. That was at least three years ago. Anyway, the drive worked (after reinstalling it twice — read my BIO, I’m not a techie), and the VAIO is not running Ubuntu, very slickly, I might add. I can’t figure out how to cut off the touch pad as a mouse clicker, but perhaps tonight. My plan is to use the old laptop in some of my presentations, to demonstrate the viability of OSS as a teaching and learning tool. My only problem is that the thing weighs about nine pounds. 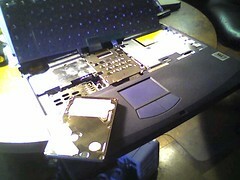 Anyway, my point in writing this post is that I’m still using my G4 Powerbook to write it. There is no comparison. Open Source is very cool and a fantastic set of tools that might go a long way toward solving some pretty vexing problems that are critical to our future, that of getting contemporary tools and contemporary information into the hands of children who are being prepared for the future. I’ll continue to use and talk about OSS. But it’s not OSX and I remain a Mac Man! Our task should not be so much about finding a cost-efficient way to equip our children with contemporary information technologies. Instead, we should realize that equipping our children to learning for their future is worthy of investing in. For a few weeks now, people have been congratulating me for being singled out, along with Will Richardson, as “must-read” blogs in Edutopia’s Reader Survey. I clicked to the web page, read about Will’s thoughtful Weblogg-ed.com and my entertaining 2¢ Worth. Cool! I can’t think of anything better. Again, not a surprise, though I think that we need to come to an increasing consensus that the computer is the pencil and paper of this day and time. That’s my opinion! True enough. I’m finally making fairly extensive use of mine, now that I’m dabbling in Linux. I thought it was just because there was a Staples store only a mile away from my house. It was interesting to read on into one responders claim that the school dumpster was his best source for freebies. I’d suggest others, but none would beat this very fine movie. I want to know the ideal amount of time required to prepare for the ideal class session? I agree, though it shows some lack of imagination. For free? Europa? Rome? New Zealand? London? Stonehenge? Athens? Xerox Parc? Well, it’s a GOOD question. A very fine book. The River is Wide, Pat Conroy, is why I became a teacher. Who, from the past or present, would you like to teach your class for a day? Martin Luther King Jr. I can’t argue with that, though this too, is a very GOOD question. OK, Comon! We badmouth the lecture because it is the exact opposite of the style of learning that we are promoting with technology. But it doesn’t make good lectures “bad”. Good lectures are a joy to watch and listen to. It is lecturing all day and every day that we should be discouraging. My answer to this question? Meaningless and shallow worksheets. Fun aside, EduTopia is an excellent publication that aims at the heart of education. Please subscribe (free to educators) and spread the world. Class Blogmeisters have lately been discussing on their mailing list about the barriers they face in their efforts to get more teachers involved in blogging. Most stories involve a handful of teachers giving it a try, and most of them dropping it after one or two assignments. Complaints include the time it takes to review the student blog entries, lack of hardware, and so on — all legitimate barriers that are bigger than any one good teacher. ..and I would be the first to say that blogging isn’t for every teacher. It is not the pinnacle of technology integration, nor is it a fad. It’s just a continuing evolution of tools that empower students to become one with their learning, and not just a container for their learning. That’s my opinion. This statement bounced me over to some ideas that I have been exploring around various similarities between flat world issues and new forces driving economic growth, and flat classroom issues and new forces that are required to drive academic growth. You can re-read my introduction to Flat Classroom Learning Engines here, but the bottom line is that when teachers are no longer so clearly above their students in skill and knowledge (at least from the perspective of the students), then the gravity of a symbolic grading system begins to lose it’s force. A new source of energy is needed to drive the classroom as a learning engine. Classroom blogging is a very flat endeavor. A teacher, who does not understand this, may use it explicitly as a writing tool, giving a writing assignment, and then grading the work based on writing technique. This would not surprise most students who are accustomed to the gravity forces behind teaching from the hill. But if the assignment is less about the technology of writing, and more about our inalienable need to communicate, involving as much the reading and responding as the composing and editing, then the work flattens out into a classroom endeavor that engages both learner and teacher. The boundaries between the two begin to blur. This is a good thing. As students become empowered by their own curiosity and need to communicate and influence, and a cultivated orientation to the future and grounding in heritage, then teachers can come down from a hill, that is all but transparent to their students, and participate in a learning engine. Borya, “Image of a Hill.” Borya’s Photos. 18 Feb 2006. 19 Apr 2006 <http://flickr.com/photos/barthelomaus/101120685/>. There has been an impressive continuing discussion on the New Stories topic among people whom I respect a great deal. Lots of stories have been suggested that range pretty widely across a number of qualities. I thought I would suggest some classification of new story types, so that we can begin to talk about stories within the context of similar plots and functions. I am describing three types of stories: Community, Reformer, and Implementation stories. They differ in their length, intended audience, and goal. There is also a fourth type of story that has been suggested, which I am not including at this point. These are the stories that teachers tell their students, as a context builder for specific learning objectives. This may, in deed, be the place to include these stories, but I’ll wait for your opinions. So here is the breakdown. I will also be including this structure in the New Story Wiki Page (http://newstory.davidwarlick.com/). Non-educator community members, including parents, community leaders (and voters), legislators, etc. A one sentence statement designed to surprise the listener and usually beginning with something like “Did you know that…”. The story sentence is followed by a stated or implied moral or conclusion leading to an intended paradigm shift in thought about education. Did you know that McDonalds puts pictures on their cash registers, not because kids do not have basic math skills, but because the average McDonalds restaurant services more than 1,500 transactions a day? Success has less to do with the basic skills of making change, and much more to do with adapting to new information environments. This level of new story is designed to affect a community’s vision of what education is, and the evolving roles of teachers, learners, and their classrooms. Educator leaders who influence local, state, national, or international visioning and structuring of education. These stories are usually longer than community stories, but they also address the market place and deeply held community values (our children). They usually point to an obvious, yet not intuitive flaw in the prevailing structure and curriculum of education and result in a comparison between how it’s done now, and how it might/should be done. Reformer stories are designed to affect how educators with influence shape their visions, their messages, and their decisions with regard to retooling education within new environments and conditions. This is a longer story, which makes an explicit (or sometimes implied) statement about the nature of learning, teaching, and learning spaces. It points to examples that can be modeled and also points to changes in the market, and deeply held values (our children). The world is flat because of…. Our classrooms are flat because of… If we can no longer rely on the gravity inherent in hierarchical teaching, then here are ways that we can harness the energies of curious and communicative children to craft learning engines. Help educators to value and implement risky but well conceived new teaching and learning strategies, that tie to the changing market place, the evolving information environment, and children who, because of these changes are wired differently as learners.